Another story that's been lingering in my Inbox. Sorry it's late. 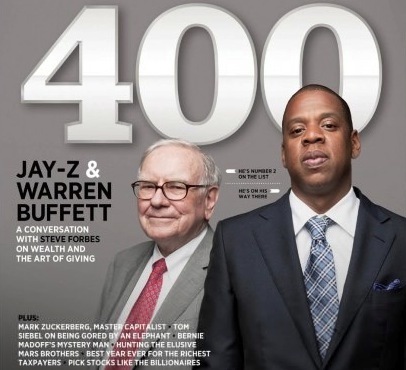 I was surprised as the next guy to see Jay-Z on the cover of Forbes magazine with Warren Buffet. But not because Jay's black, a rapper, or an entrepreneur (aka ex-drug dealer.) No, it was seeing Jay-Z in a suit! Has anyone seen Jay-Z so uncomfortable as in the video below? Why the cover story? Jay-Z was being welcomed to the first "Forbes 400 Summit" and joining the ranks of the likes of Bill Gates. I didn't know the stats, but here they are, "Jay-Z is one of the top recording artists in history, having sold approximately 40 million albums worldwide. In 2007, he tied Elvis Presley for the most number one albums by a solo performer; he went on to break the record in 2009. Today, only The Beatles have more number one records –19 to Jay-Z’s 11." 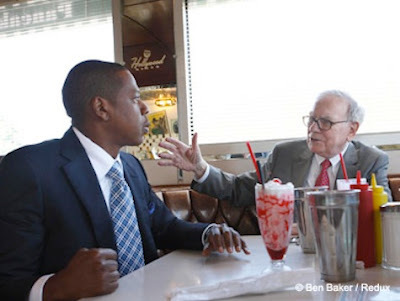 In the video below, Jay-Z compares his art with Warren Buffet's analysis of stock tickers when he's seeking the truth about a business' value. This serious interview by Stephen Forbes, an outsider of entertainment and non-fanboy is refreshing and gives us a different insight. We learn more about Jay Z in the video interview than 100x Complex articles! Consistency Why has Jay Z continued to be so successful after so many years? Jay Z's Genius When did the penny drop for Jay Z and his empire-building streak? Watch all 52 minutes of the interview hosted by Stephen Forbes. And learn about Jay Z's cold sweat moment when he lost his iPod with his latest un-released album on it...just as he was about to pay $5 million to buy his contract from Def Jam! Jay-Z & Warren Buffett Cover Forbes Magazine!